Kallang Park Connector (PCN) is considered one of the spines of the national PCN network as it provides a direct cycling access from the waterways of Ang Mo Kio-Bishan Park to Kallang Riverside and further down, the cultural and business districts. This will be an attractive cycling prospect for both daily bicycle commuters and recreational users. An elevated crossing positioned parallel to the newly proposed pedestrian bridge for direct access for cyclist from both sides. 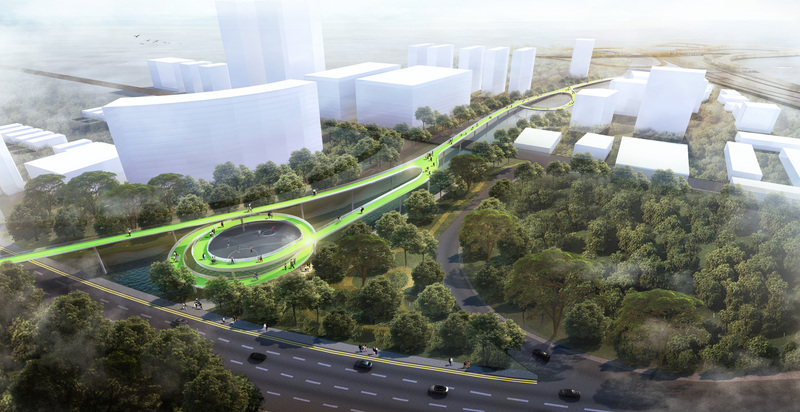 The meandering ramp at both sides is to give easy access to commuters coming from the crossing road. The ramps are positioned over the canal to save space at grade. The swirling form is meant to engage recreational users as an emotive connection to the waterway. The existing Underpass crossing pavement is deepened by 600mm to meet the minimum 2.4m headroom. The underpass can be enhanced with artwork wall and allow for more lights to come in with solar skylight wherever possible. 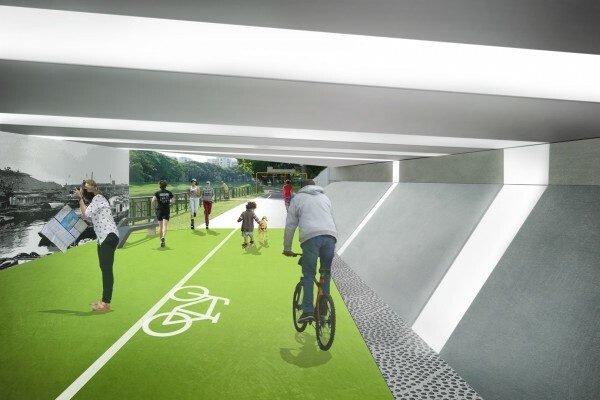 The proposed underpass is a lengthy stretch along the canal, strip lightings from the ceiling will envelop the side wall, proposed to enhance visibility. This will also act as a form of comfort for users using the underpass. Between crossings 3 and 4 we have chosen a combination of floating bridges and long gentle ramps. The waterway crossing, a pontoon bridge, is adopted due to the feasibility to meet the minimun 2.4m headroom. The selection of pontoon bridge crossing is the best option as the shortest and fastest crossing as compared to elevated crossing option. 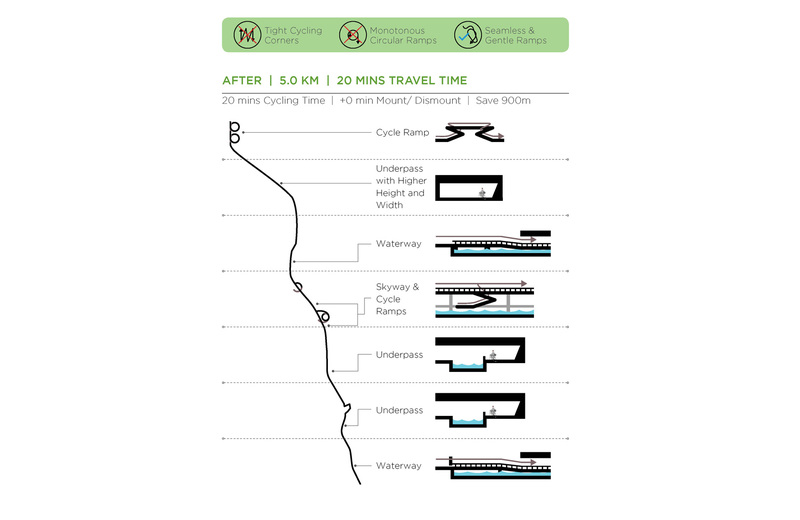 After crossing the PIE highway, the pontoon bridge changes to a long ramp with a gentle gradient of 1:25, ramping up above the existing canal due to limited space at both canal sides. 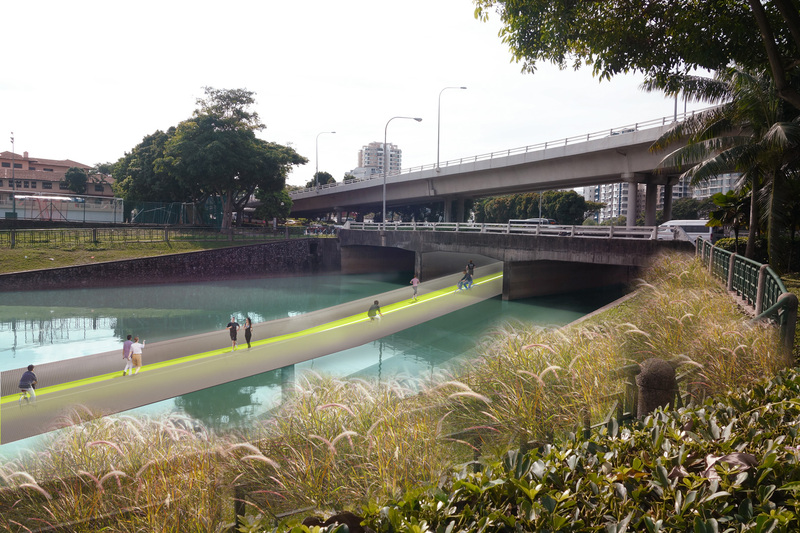 From the waterways, a gentle ramp leads the cyclist to Serangoon Road and Bendemeer Road. The ramp transforms to an elevated crossing and crosses over Serangoon Road and Bendemeer Road, after which is ramps down to meet the Kallang and Whampoa PCN. At certain nodes between the PIE, Serangoon Road and Bendemeer Road, we employ ramps for shortcut access to the neighbouring areas. The combination of waterway and skyway crossings provide a seamless and enjoyable experience for all users. 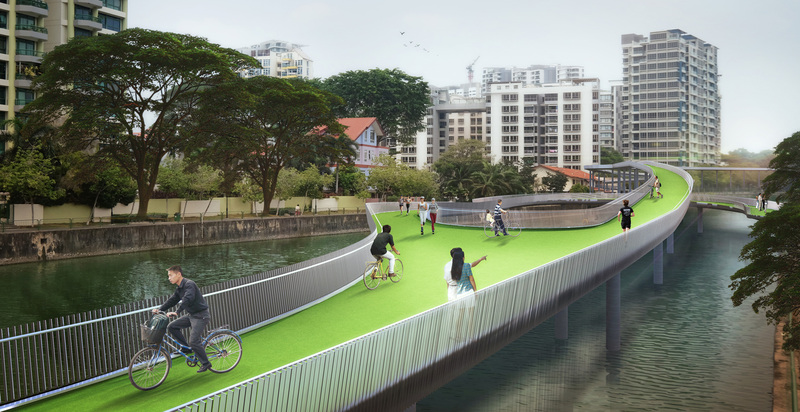 From the waterways, a gentle ramp leads the cyclist to Serangoon Road and Bendemeer Road. The ramp transforms to an elevated crossing and crosses over Serangoon Road and Bendemeer Road, after which ramps down to meet the Kallang and Whampoa PCN. 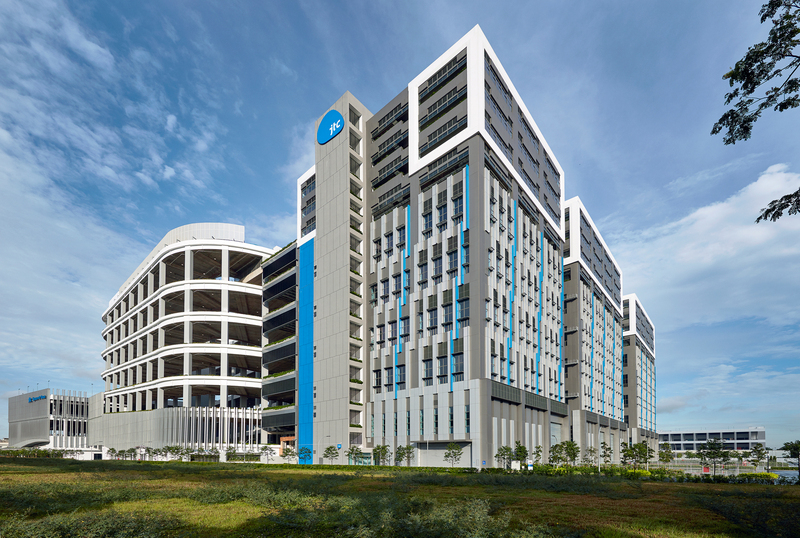 At certain nodes between the PIE, Serangoon Road and Bendemeer Road, we employ ramps and spiral staircases for shortcut access to the neighbouring areas. The combination of waterway and skyway crossings provide seamless and enjoyable experience for both commuter and recreational users. Making use of the space under Kallang Bahru, we propose a deepened underpass for a straight direct access for all users. The side wall along the canal are opened up to allow for natural lights and scenery. The minimum interventions allow for a fast and seamless connection. Adopting art into the underpass is a form of engagement the users will have with the PCN. These artwork could potentially be a collaboration between neighbouring schools and local communities. 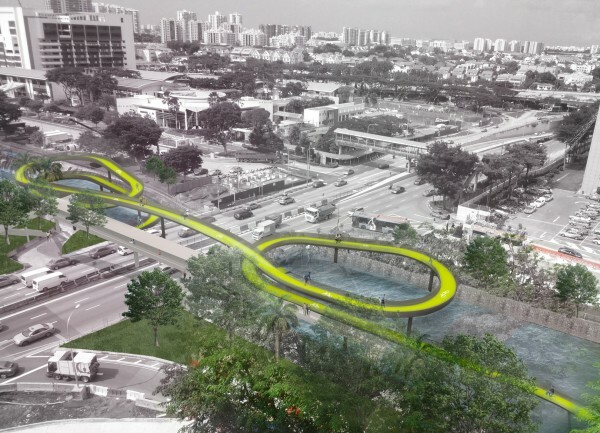 Similar to Kallang Bahru, an underpass tunnel is proposed to cross Upper Boon Keng Road for a straight direct access for cyclist and pedestrian. Side walls opens up to allow for natural lights and scenery. Also similar is the adoption of artwork engagement with the community. A pontoon bridge crossing two roads for a direct connection, will provide enjoyable rides or strolls, close to the Kallang River. Ramp gradient of 1:25 is provided at both sides of the connections. We proposed a width of 4.5m for the new underpasses and overpasses bike path. This will allow 2 cyclists riding side by side in each direction – or a pedestrian overtaking a slower recreational cyclist without conflict with cyclists going the opposite direction, providing a generous space for the pedestrians too. 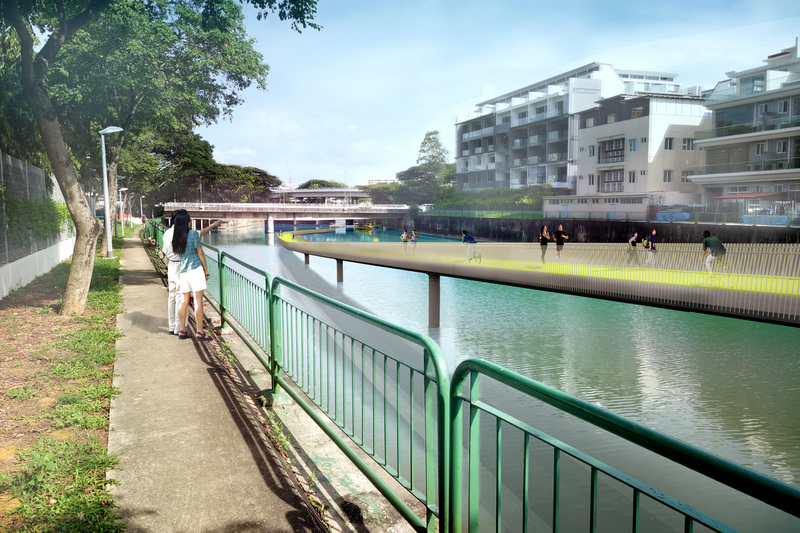 As the last crossing of the Kallang Park Connector, this floating pontoon acts as a direct connection to the Sports Hub. This will be a useful walkway especially during huge events or festivals.